Deciding whether to send your child(ren) off to overnight camp for the very first time can be a challenging decision. Like most parents, you probably have many questions. What age is appropriate to go away to overnight camp for the first time? Which camp is right for my child? Is my child ready to attend overnight camp? By considering the answers to all of these questions, you will have a better idea of whether you and your child are ready for overnight camp. The following are some helpful tips for parents and guardians when deciding whether to register their child(ren) to attend overnight camp away from home for the first time. Ask your child if they want to attend camp. Although you may want your child to attend camp because of the positive life-changing impacts it will have on them, it is just as important to ask your child whether they actually want to attend camp. Campers who are intrinsically motivated to attend camp rather than those who are extrinsically motived by their parents or guardians to attend camp will have a more positive experience at camp. 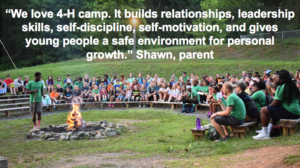 By having honest, heart-to-heart conversations with your child(ren) about attending camp, you can get a feel for whether they truly want to attend overnight camp away from home. This will set them up for success at camp for their first time. Start with day camp. Although there is a huge difference between the day and overnight camp experience, starting with day camp will introduce your child to the camp experience gradually. By starting your child(ren) by attending a summer day camp, this will introduce the camp experience, but with the comfort of coming home every night. Introduce overnight experiences. A next step in building children’s confidence in spending the night away from home is to spend the night at someone else’s house, such as a grandparent, relative, or sleepover at a friend’s house. This is a great next step to see if your child is ready for an overnight camping experience. Register with a friend. Another great way to alleviate some of the fears of attending overnight camp for the first time is to encourage friends or neighbors to register to attend camp together. This provides at least one buddy to start the week of camp. Betsy-Jeff Penn 4-H Center: Sunday, May 5, from 2–6 p.m.
Eastern 4-H Center: Saturday, April 13, from 10–2 p.m.
Millstone 4-H Camp: Saturday, May 11, from 2–4:30 p.m.
Sending your child(ren) off to overnight camp for the first time can be a challenging experience, but by following some of these helpful tips it can help alleviate the fear of sending your child(ren) off to overnight camp away from home for the first time. Although some children may experience homesickness during their first camp experience, by building their self-confidence through a progressive approach, you can establish a solid foundation for their first overnight camp experience. Often times it’s more difficult for the parent(s) than it is for the child(ren) during the first overnight camp experience. However, an overnight camp will be a life-changing experience for your child(ren) with positive impacts that last a lifetime and will leave them wanting to attend camp every summer until they age out. • Register Now for North Carolina 4-H Camp: The Best Week of Summer!